My mom had a sweet little cookie jar sitting on the counter growing up. I remember it most often held no-bake cookies. One of my all time favorites by the way. It wasn't always filled with cookies and it wasn't the most expensive cookie jar in the whole world, but there it sat on our pink Formica counter tops, right there by the window, year after year. And sometimes it had cookies in it. Fast forward about twenty plus years and I was wandering through a new thrift store...waiting for some amazing treasure to find me, perusing the aisles and reveling in the history. That is what I usually do in thrift stores. I love the thrill of the adventure and wondering what new/old thing will find me next, that perfect little something I never knew I always needed. Of course that brings on a whole new set of challenges. One must be careful on the amount of treasures one takes home or one's home will turn into something akin to a junkyard. I have to repeat that to myself often in thrift stores. But, back to me wandering aisles blissfully...there I was trying to weed out what I would really truly use, when all at once--time stood still, music filled the air and there gleaming on the shelves was the *exact* cookie jar we had when I was young. I had to buy it. There were no other thoughts. I am so glad I did. The kids think it is the most fun ever. Q feels most adamantly that cookies should grace its presence at all times. 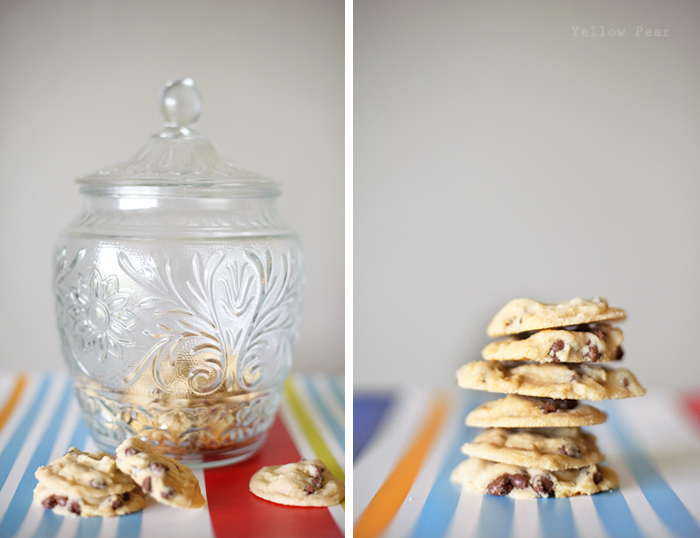 Cookies never remain in cookie jars for very long though, so it's a good thing sweet memories do. 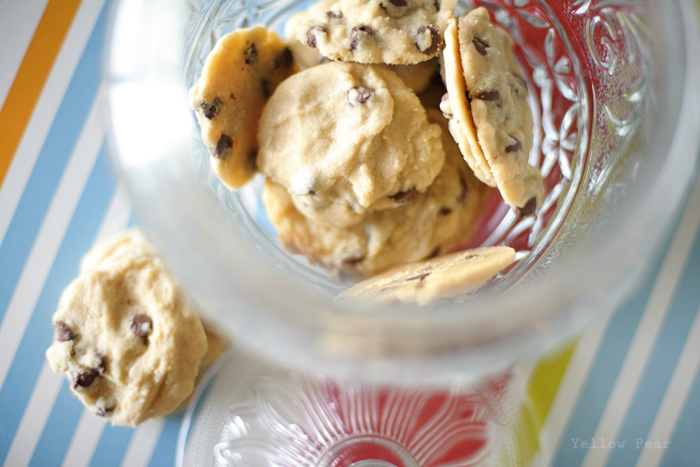 And I finally found a chocolate chip cookie recipe that meets my requirements. There are only two. Easy and yummy. Oh and maybe one more...fail-proof. I got it from Becky Higgin's blog. Also I have found that leaving them a tad under-cooked makes them so delightfully delicious. Mix thoroughly first 6 ingredients. Stir in remaining ingredients. Drop on ungreased baking stone. Bake 8 to 10 minutes at 375 degrees. This is a single recipe which makes about 7 dozen. Why do I think I was with you when you bought this...was I? I always love a good story. Can't believe you'll be here so soon. Very excited! Because you were. :) It was magical! !